In the course of managing several hundred websites, we've seen it all when it comes to domains. We've also seen that many business owners aren't aware of the dangers of not understanding basic domain information. Where does it point to? Below we'll look at the domain mistakes you could be making, and how to get things under control. I had a guy set up my domain and website for me. This is the most common scenario we see. And it almost always creates a problem. Some guy set up your domain and website and now you need to make changes. This was a big mistake on your part. You may or may not be able to get in touch with this person. Don't let anyone purchase a domain on your behalf, even your marketing agency. Purchase the domain on your own. This can be done anywhere. Godaddy, IPOWER, Network Solutions, or 1&1. Don't worry about the website or your mail, or your Wordpress site, or your Shopify site, etc. Believe it or not, that's ALL SEPARATE. My domain is registered on my agency's portal because they built the website. Again, not relevant. Get your domain under your control. 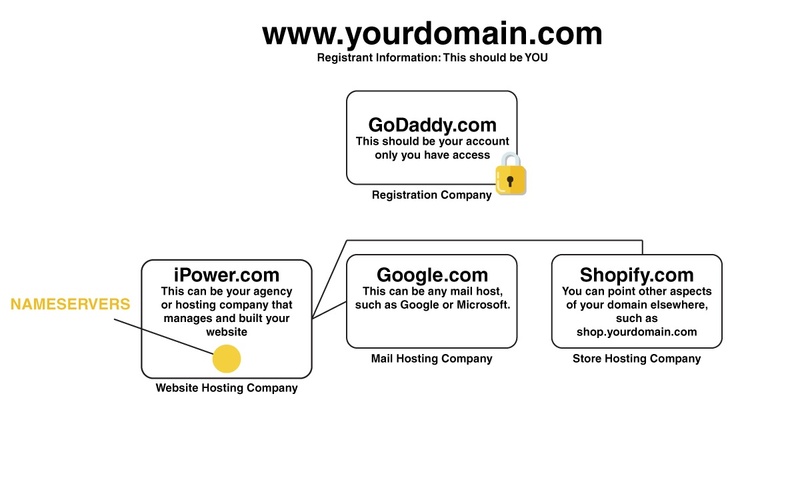 GoDaddy is very helpful with this process, just because he is running your website doesn't mean you can't own the domain. Transfer the domain away from your "guy" (not the website, the domain) and then point the domain to him so your website works properly. Now you own the domain and have full control of it. 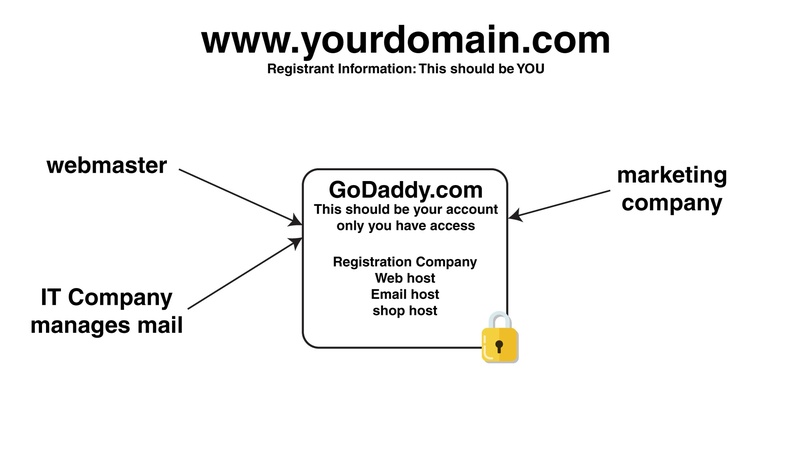 Check whois.com to make sure the domain's registration contact is YOU as the owner, not your agency. This is common, but you'd better get this taken care of ASAP! We've spent countless hours trying to track down domain registrars, administrators, reseller websites and owners in order to locate the origin of a domain's account and it is NOT FUN. Here are the steps to get control of your domain if you just have no idea. Contact the registrant on the whois report and ask for further clarification. Then go where they say you need to go. When you finally have spoken to the person who has control of your domain, and talked them into cooperating with you on moving the domain because, after all, you DO own it, then get an account with GoDaddy and call them up. They will assist you with the transfer of the domain. Now, very important to understand what NAMESERVERS are. This is your "pointing" control. 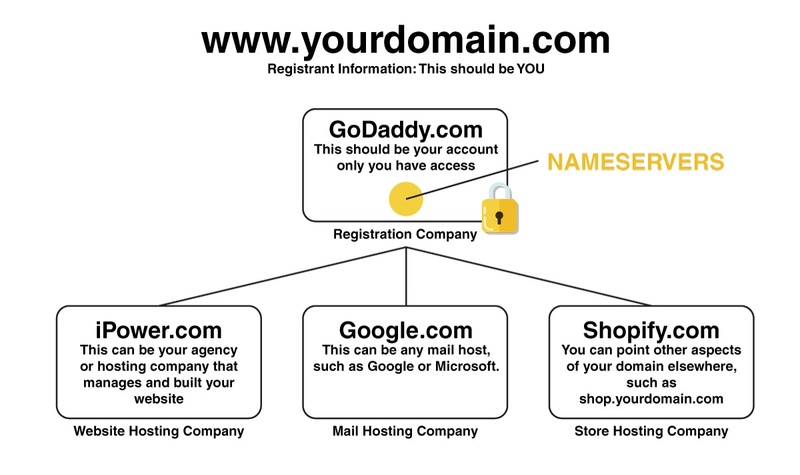 NAMESERVERS decide who controls where your domain goes. It's always good to keep this at the registrar, but sometimes it's okay to put it elsewhere. Here's a simple illustration that shows you a healthy domain path with different nameserver control. The bottom line here is to make sure that you have full control over your domain. Once you own and manage the account where your domain exists, you will never have to worry about adding a website, updating your mail company, changing website vendors etc. I'm not going to get into zone records and DNS settings here just because it varies, plus there's tons of information on the internet for that, just Google it. But that's what tells the domain to look where it needs to. This post is strictly to get you to get control of your domain now. One more thing, you can always have one company that handles everything and YOU still own everything. I have multiple domains and they're all in different places. Our recommendation here is to get them all on one account. But that can be an extremely time consuming process. Just make sure you know where they are registered, you're the owner, and you're in control. Here's a great DIY domain health chart you can use to make sure you have everything in line and accessible when you need it. 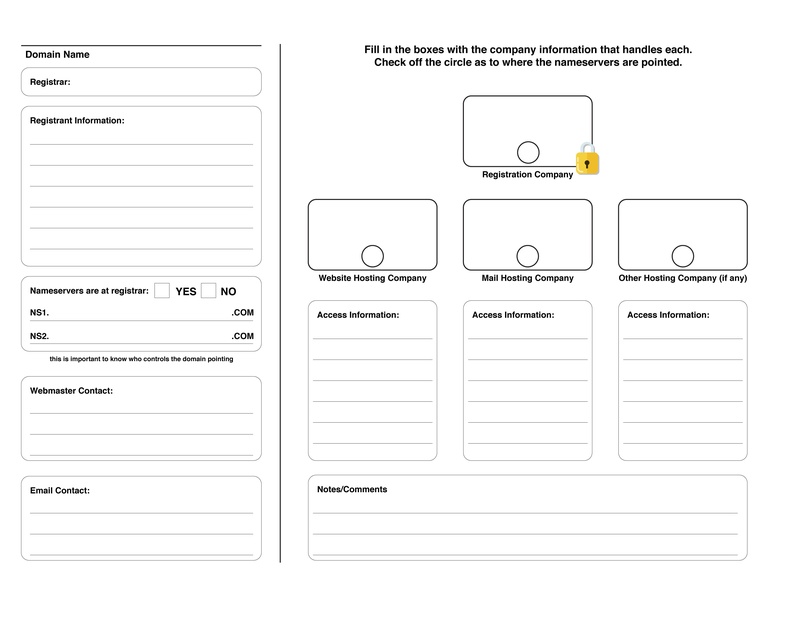 Click here to download this image and here is a SAMPLE filled out. Thanks for reading. 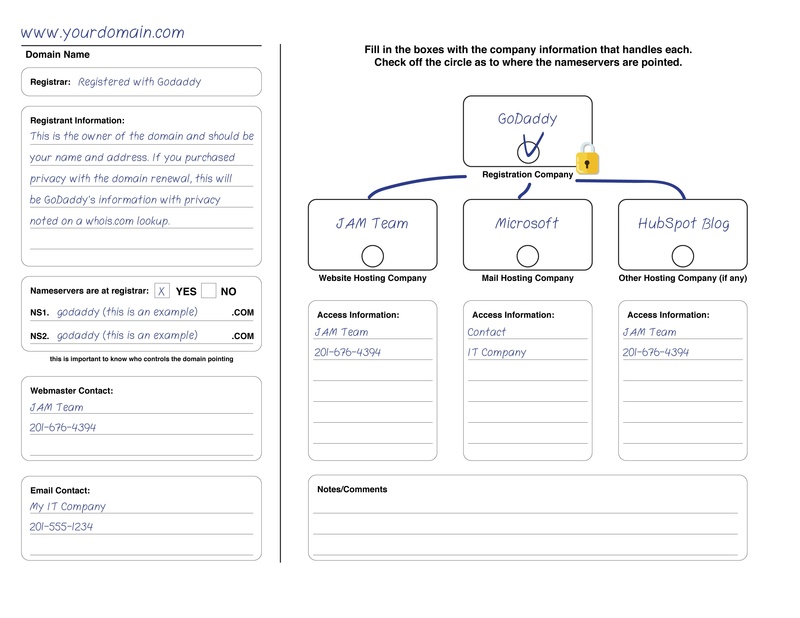 Need help with your domain situation? We're always here to help.